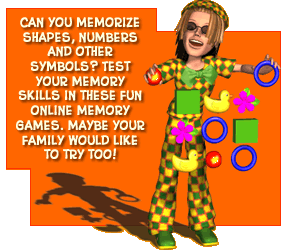 FREE MEMORY GAMES FOR KIDS - Fun and challenging online memory games. Kids are not the only ones who will find these games engaging. Grown-ups can benefit by exercising their memories too! These Online Games are licensed to theKidzpage.com and may not be copied to other websites. Online Memory Games for Kids!